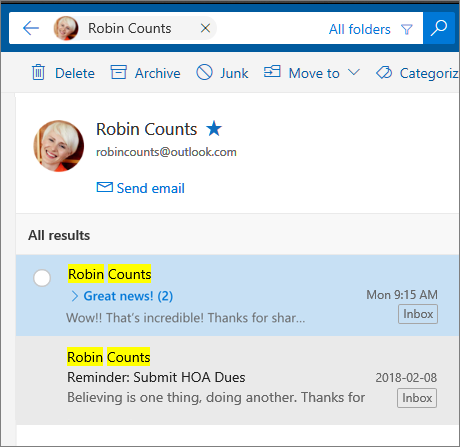 In Outlook on the web, you can use the search bar at the top of the page to search for email messages and people. In the Search box, type what you want to search for (a contact, subject, or part of a message) and press Enter. When you're done with the search, select Exit Searchin the Search box or choose any folder in the navigation pane to exit the search. 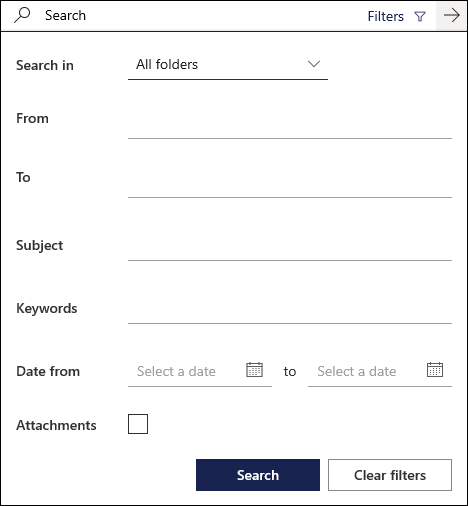 You can use Search filters to refine your search with options like Folders, From, To, Subject, keywords, date ranges, and attachments. To use search filters, select Filters at the end of the search box. Enter your search keyword in the Search Mail and People box. Select one of the suggested messages or contacts, or press Enter to see all the possible results. Tip: If you're searching for a contact, choose the Search People link at the bottom of the list of suggestions to limit the search to your contacts and your organization’s directory. After you enter your keyword, you can refine your search to only include email messages in a certain folder, from a specific sender, with attachments, or within a certain date range. To clear your search results, move your cursor over the search box and select Discard . In folders: Only search for messages in a specific folder, such as Inbox, Sent Items, and Archive. From: Only search for messages from a specific sender. Options: Only search for messages that match certain criteria, such as messages with attachments. Date: Only search for messages within a certain date range. When you enter a name in the Search Mail and People box in Mail, a Search People option appears. Selecting this option lets you search in People, where your search results will be limited to your contacts and your organization's directory. In the Search Mail and People box, type the name of the person, group, or resource you want to search for, and press Enter. At the bottom of the search results, select Search People. Refine your search by searching only in Your contacts or Directory. Use Advanced Query Search (AQS) to refine your search results. In the search box, type an AQS keyword from the table below, followed by a colon and what you want to search for. For example, to find messages with a subject that contains “report,” enter subject:report in the Search Mail and People box. A search for HasAttachment:yes returns only email messages with attachments. To further specify the email messages you want to search, use words or names from the mail in conjunction with the search keyword. For example, blue hasattachment:yes would return only email messages containing the word "blue" that include attachments. A search for HasAttachment:no returns only email messages without attachments. A search for IsFlagged:yes returns only email messages that are flagged. A search for IsFlagged:no returns only email messages that are not flagged. A space between two keywords or two property:value expressions is the same as using AND. For example, from:"Jerri Frye"subject:reorganization returns all email messages sent by Jerri Frye that contain the word reorganization in the subject line.